An exuberant celebration of the big band era, and the music it spawned, Swing! was a superb showcase for a cast which included some great dancers, some splendid vocalists, and a band that gave its all at the service of some of the best tunes composed between the late ’20s and the early ’40s. “It was the most creative period of the century,” commented Lynne Taylor-Corbett, who directed and choreographed the show, and who set out to demonstrate what she meant. With Ann Hampton Callaway, Everett Bradley and Laura Benanti, fronting the band, Swing! opened on December 9, 1999 at the St. James Theatre, and closed a year later after playing 461 performances. 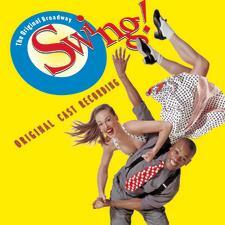 To put on a production of SWING, Click Here!